Mining firms have been one of the main corporate sectors worldwide to take advantage of investor-state dispute mechanisms to sue states for regulation of mining, having sued governments for a total of USD 53 billion so far. The Philippines, one of five countries worldwide with the highest overall mineral reserves, has a web of investment treaties which severely constrain the government’s ability to regulate or close polluting mines. This legal straitjacket will become even tighter if the EU–Philippines Free Trade Agreement and the Regional Comprehensive Economic Partnership (RCEP) proceed. In the last decade, the resource-rich Philippines has bet heavily on the mining industry as a development strategy, an approach that has come under growing scrutiny. With 47 large-scale mines in operation and growing evidence of their social and environmental costs, all the presidential candidates in the May 2016 election were forced to explain their position on, and their financial ties to, the extractive industry. Most candidates, including President-elect Rodrigo Duterte, argued for “responsible mining” and an end to “exploitative contracts”. Yet few candidates addressed whether a new government could effectively enforce new regulations on a largely foreign-controlled mining industry. This briefing argues that the country’s ability to properly regulate or close polluting mines will be severely constrained by a network of investment treaties the Philippines has signed, which provide excessive protection for foreign investors. This legal straitjacket will become still tighter if the government goes ahead with the EU–Philippines Free Trade Agreement and the Regional Comprehensive Economic Partnership (RCEP). The need for further regulation of the mining industry in the Philippines has become ever more obvious since 2004 when mining was declared a priority for “national economic development”. Despite promises of economic growth, industrialisation and jobs, the industry has contributed less than 1% of the country’s Gross Domestic Product (GDP). Moreover, many mines have been found guilty of human rights violations including illegal demolitions, harassment of local residents, and of environmental impacts such as water pollution, as documented in the Rapu Rapu Gold Silver Copper and Zinc Mining Project and the Dipidio Gold and Copper Mine. Indigenous communities have been particularly hard hit as it is estimated that two-thirds of officially recognised ancestral domains are covered with mining concessions. Environmental damage has also been a major concern as almost 50% of all key biodiversity and protected areas are affected by mining. The government has had to suspend several mining operations, such as those in operating in Surigao del Sur, Zambales and Cagayan, mainly as a result of investigations into their compliance with environmental policies. Growing anger at the impacts of mining on the communities and environment, and the policies that allow it, led to the creation of the Alyansa Tigil Mina (ATM)—a coalition of organisations and groups that has decided collectively to challenge the aggressive promotion of large-scale mining in the Philippines. They initially sought the scrapping of the 1995 Mining Act (RA7942), an end to full foreign ownership, a stop to large-scale mining and the formulation of an alternative bill that would require strict regulations on mining. These demands became part of a national debate in the run-up to the national elections. 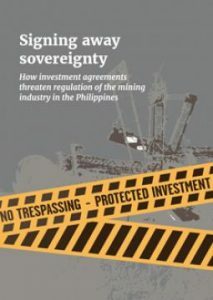 As this briefing shows, however, the mining industry has a very effective line of defence against regulation, namely the existing network of investment treaties that the Philippines has ratified: 31 Bilateral Investment Treaties (BITs) and seven Free Trade Agreements (FTAs), all of which have an investment protection chapter. These include treaties with Australia, Canada, China, Japan, Malaysia, South Korea and the UK—all host nations of major multinational mining companies. All of these treaties, bar very few exceptions, allow investors to sue the government at international arbitration tribunals if they consider that their profits have been unduly affected. Extractive companies have been one of the sectors most given to launching arbitration lawsuits, and 52 current cases worldwide are relating to mining. Based on the 44 cases for which data are available, mining companies have sued governments for a total of $53 billion. Denying or revoking mining permits because of environmental concerns or violation of the human and social rights of indigenous communities has already led to at least ten investment treaty cases. The governments of Bolivia, Indonesia, Mongolia, Peru and South Africa have all faced costly lawsuits after taking measures to tackle fraud within the mining industry, make mining companies comply with an agreed pollution clean-up, and remedy past discrimination. Indonesia and South Africa eventually lowered environmental standards in order to pre-empt such lawsuits. The Philippines has yet to face a mining-related arbitration lawsuit, but has already experienced a very costly case launched by the German company, Fraport. Although the Tribunal eventually dismissed the case, the Philippines government ended up paying USD 58 million solely in legal fees, equal to the annual salaries of 12,500 teachers. A growing number of countries are beginning to understand the financial, social and environmental costs of the system of investors’ rights—with countries as diverse as Australia, Bolivia, India, Indonesia and South Africa revising their investment treaty policy. That is why the Philippines government’s move to negotiate RCEP and the EU–Philippines FTA, which will extend investors’ rights with more countries, is a dangerous step that will prevent effective regulation of the country’s mining industry. Worse still, unlike the existing BITs, it will be much harder for the Philippines to revise its investment policies in the future since regional trade agreements (unlike BITs) do not expire. The stark truth that communities across the Philippines who are facing pollution in their rivers and destruction of their lands have realised is that they are up against some of the most powerful transnational mining companies, and that an international trading system is stacked against them. This complex web of trade and investment agreements has created an architecture of impunity that has made it increasingly impossible to reject or even effectively regulate mining operations. It is crucial that the Philippines starts to unravel this web by halting negotiations on further treaties and seeking to revise those that are already in existence.